The 1993 Mustang GT came with the big 5.0L HO V8 engine, air conditioning, a cargo tie down net, floor mats, and optional two-tone paint. The 1993 Mustang GT only came in the hatchback and convertible body styles. The GT did not come in the 2-door sedan body style. Compared to the base level LX, the Mustang GT front upper grille was closed, fog lamps installed under the front bumper, side scoops, and Mustang GT embossed into the rocker panels. This factory Royal Blue clearcoat metallic 1993 Mustang GT hatchback is owned by Chet Zeidler of Huntertown, Indiana. It has Titanium lower, two-tone paint which was only available on the GT and with upper colors of electric red, bright blue, royal blue, reef blue, and silver. Chet says that he recently purchased the car from the second owner who had the car for 8 years and only put 2K miles on it. The car has 56K miles on it. Black 1993 Mustang GT hatchback owned by Rich Nagle from Chalfont, Pennsylvania. Rich tells us, "I bought it new from Yocum Ford in Lansdale Pennsylvania September 20, 1992. I race and show it and it serves as my daily driver in nice weather. The original bottom end has 207,000 miles on it. Originally equipped with an automatic transmission, I converted it to a 5-speed manual transmission in 2004. The car's best time at the dragstrip is 12.7 seconds at 105 mph. My GT does not have a power adder but has had several modifications. They are all listed on my website www.NASTY93.com." This Bright Red Mustang GT coupe was photographed at the 2010 Mustang car show in Port Angeles, Washington. There's a 302 cubic inch (5.0 liter), High Output, V8 engine under the hood; originally rated at 205hp (at 4200rpm). 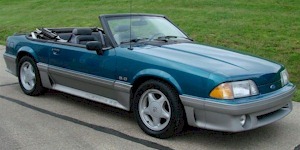 Two-tone Reef Blue over Titanium 1993 Mustang GT convertible. It has an Opal Gray cloth interior and a white convertible top. The Titanium lower accent treatment was only available on the GT and cost an additional $159.